Which software do you use for mapping? As in, level editor (Quark/Radiant) and compilation software (Q3map2, BSPC). I need versions too. I use NetRadiant 1.6.0 with Q3Map2 from GTKRadiant 1.6.4 and BSPC from GTKRadiant 1.5. I need your answers because I want to prepare updated entity gamepacks for OpenArena, so we can also get official support in the editors. I want also to ship OA's own version of mapmedia.pk3. I want to ship the sources and assets (textures, models, sounds) of three maps (for Q3 these maps were q3dm1, q3dm7 and q3dm17) so people can see how they're done. I'm thinking on shipping oa_rpg3dm2 and oasago2. I want to ship a third and last map, preferently a well done map. FTR only the .map files and the assets, not the already compiled maps. Any idea on wat the third map could be? Not sure. But maybe one might include an appositely-prepared test map which contains examples of a lot of things, such as water, lava, teleporters, portals, mirrors, jump-pads, doors, buttons, bezier curves, clipping (including "clipped" mapobjects), etc. So one may just copy-paste from that as a starting point and then modify. Akom did something similar for his mapping tutorial in Italian. Uhm... maybe such stuff may be even more useful as a complement for your "mapping manual"? First question was the software used for mapping. You already know: I used Q3Radiant up to now: I tried to switch to NetRadiant or GTKRadiant last summer, but I had problems (in both program usage -e.g. how to copy a texture from a surface to a large selection of brushes, aligning the texture to the first brush in the process?- and compiling results) and at the end I gave up. I will have to do more tries. Second question was about a third OA map to use for the gamepack, and answer is "not sure" (a.k.a. "I don't know"). PS: Are we sure "info_player_dom_blue" and "info_player_dom_red" do really exist? Just a question. I know but others don't. And if the first posts don't answer this question then this thread is up to derailing, which I don't like, especially for a serious case as this. It already happened with the Quake Tribute mappack thread. I don't want that to happen to this. 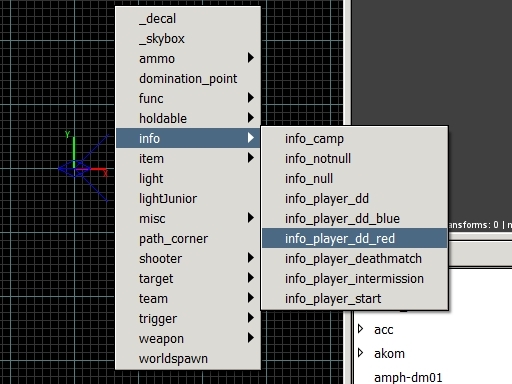 And the dom points were mentioned in the wiki and they are there in the source code (game/g_spawn.c). GTKRadiant, downloaded from someone's Github accoutn (I think it was TTimo) and patched to stop crashing because of my buggy Intel videodrivers. q3map2 downloaded from GTKRadiant binary distribution, and some very old bspc, which does not crash for me, I don't remember where I've got it. The situation with OA mapping tools is pretty much the same as with ioq3 engine - there are at least five different versions/repositories, and the 'official' one does not work with OA. They do not exist in 0.8.8. They where added in OAX r299. It looks like Xonotic has a newer compilable version http://dev.xonotic.org/projects/3/wiki/Netradiant - That is properly the one I would use today. When creating the entity files please remember to include information about the "message"-field on "domination_point"
Ultimately you would just have one base file and compile the individual packs from it (xslt, scripts etc.). i did consider it but it was very hard because there are no free pack for Q3 and without a free Q3 gamepack it is hard to create OpenArena pack that are as good as a modified non-free Q3-gamepack. I did try to create some scripts to extract the items from bg_misc.c but after that there are still comments to all the flags etc. In NETradiant the DD_player Blue and Red are implemented. Don't know if in the game they will be recognised. 1) Obelisks should be placed with their "origin" point perfetcly aligned with the ground, otherwise bots will have problems in Overload mode. 2) DOM points do NOT really support "suspended flag", at least for the moment (I don't know if Sago has plans to fix this), although the editor allows to set it. IIRC, the DOM point will be dropped to the ground the first time it will change color. because there are no free pack for Q3 and without a free Q3 gamepack it is hard to create OpenArena pack that are as good as a modified non-free Q3-gamepack. I don't know what's actually needed. Are you sure in the GPL'd Q3Radiant sources there is not something useful? We were talking about DOM spawn points, not DD spawn points. It sound like another problem that I thought I fixed. The bots does not use the same team variable as the game logic. I changed the variable at some point to fix the problem with a bot working for the wrong team for the entire game. Last time I mapped (a long time ago) I used NetRadiant on Linux, I don't know what version.